I live in the northeast of Brazil, in the city of Maceió, in the Alagoas state. I am an architect and urban planner, but I work with landscape photography today! For almost one month I am a new owner of a Honda CB500x 2019, Brazilian model. I'm loving the bike! I chose the black color, although I find the red and the orange beautiful as well. I'm with the purple shirt in the photo! 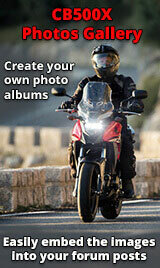 I already created a topic here in the forum to post my photos on motorcycle rides!